Prepare for adventure in a time long ago, in lands far away, where thieves give chase with swords and spears, and kings can kill with a single wave of the hand. Travel to a world where quickness of mind can save the day, and honesty is rewarded with vast, unheard-of treasures. From Stephen Mitchell come three of the best and strangest stories from The Arabian Nights: “Ali Baba and the Forty Thieves,” “Abu Keer and Abu Seer,” and “Aladdin and the Magic Lamp.” All richly illustrated with lustrous drawings, these ancient tales of deceit, greed, justice, and faith will entertain young readers night after night. A very long time ago, in a city in China, there lived a poor tailor with his wife and his only son, who was named Aladdin. Aladdin was a very brave, intelligent boy, but he was also headstrong and disobedient. His father wanted him to follow in his footsteps and become a tailor. But Aladdin wasn’t interested. “Someday I’m going to be rich and powerful,” he would say. “And then I won’t have to earn my living with a needle and thread. Just wait and see.” His mother and father would shake their heads and tell him that he was a dreamer. “You won’t be able to support yourself if you don’t learn a trade. Be a good boy and forget these foolish thoughts.” But Aladdin could never be convinced. Instead of spending his days in his father’s shop, he spent them in the streets with a gang of unruly boys. Aladdin was the ringleader. They would play games all day long: games with balls and sticks and stones, team games and games for two players, games of running and jumping and crawling and rolling and climbing, games in which you had to balance things on your head or your big toe or on the end of your nose, games in which you had to remember long lists of things or invent new names for the most everyday objects or insult your friends just enough to make them laugh and not get angry, games of hide-and-seek, games with pebbles as pieces that they played on an old chessboard someone had found leaning against the wall in an alley. Aladdin was usually the winner in these games, because he was smarter and faster than the rest of the boys. When they got tired of the games, they would make up little dramas and act them out. Actually, it was Aladdin who would make up the dramas and assign all the roles. He would always assign the leading role to himself. He would be the king or the emperor, and the other boys would be his servants or his enemies. When they got tired of the dramas, Aladdin would come up with a scheme for a great adventure that usually got them into trouble. He would dare someone to steal a peach from the grocer’s stand (it had to be while the grocer was watching) and then to run around the block and put the peach back onto the peach pile before the grocer or his dog could catch up. Or he would lead them to some rich man’s door, and they would all stand in front of it, singing and screaming at the top of their lungs, and when the rich man’s butler opened the door, they would laugh and run away. One time they found a sheet of heavy gray paper and made a pair of ear flaps out of it, then stuck the flaps over the ears of the mayor’s horse when no one was watching. The horse looked like a huge, long-nosed rabbit. They laughed so hard that they could barely remain standing. Aladdin’s parents were very disappointed in him. They called him a lazy, disobedient good-for-nothing. They were sure that he was going to end up as a beggar in the streets. After his father died, his mother sold the tailor’s shop and bought a spinning wheel. She made just enough money spinning yarn to eke out a living for herself and her son. There was barely enough to get by on, but she could almost always put a little food on the table when Aladdin came home. He showed up twice a day for meals. That was the only time he saw his mother. He was never rude to her; on the contrary, when he was with her, he was respectful and affectionate. But he never paid any attention to her constant nagging that he should get a job. One day when Aladdin was ten, as he was playing with the other boys in the street right outside the candle maker’s shop, a stranger walked by, stopped in front of them, and began staring at Aladdin. The stranger was a tall, dark-skinned man with a long nose; he was dressed in white robes, and on his head he wore a white turban. This man was a powerful sorcerer who had come from the faraway land of Morocco. One day, six months before, during a magic ritual, he had seen an image of Aladdin’s face in the center stone of his crystal necklace. He then learned that Aladdin was the only person who could hand over to him the most valuable treasure in the world, a treasure he had been trying to locate for a dozen years. Now that he saw Aladdin, he smiled to himself. Finally I’ve found the filthy little ragamuffin! he thought. All I have to do now is convince him to come with me. That should be a piece of cake. “Do you know the one in the middle?” the sorcerer said. “Thank you,” said the sorcerer. “Here is something for your trouble,” and he put a small copper coin on the counter. “What’s too good to be true, sir?” Aladdin said. At these words the sorcerer threw his arms around Aladdin and burst into sobs. “I didn’t know he had a brother,” Aladdin said. “But how is it that you don’t look at all like him, sir?” Aladdin said. “Well, I would like to present her with this gift, a small token of my brotherly love,” the sorcerer said, taking out his purse. He counted three silver coins and put them into Aladdin’s palm. Aladdin was astonished. He had never touched so much money in his life. In fact, he had never even touched one silver coin. Aladdin thanked the sorcerer and ran home as fast as he could. “Oh, and he gave me these,” Aladdin said, taking the three silver coins out of his pocket. They lay on his palm, shining. “Dear God!” Aladdin’s mother said. “Could it really be true?” And she burst into tears. Mitchell’s additions to the three stories are seamless. 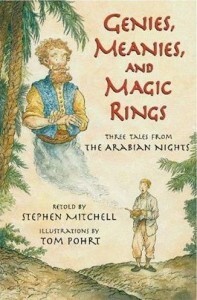 And he tells each tale in a fluid prose that is divided into short chapters and largely free of the usual heavy-handed ornamental flourishes… Pohrt gives Aladdin Chinese features in his finely detailed illustrations, and endows all of his figures, even the genies, with distinct, animated personalities. Rich in danger, intrigue and astonishing acts of largesse, these celebrations of loyalty, courage and generosity are as entertaining as they are edifying. Mitchell’s witty alliterative title captures the lively spirit of these delicious retellings.